I suppose it was the early morning mistiness and recession past the trees which interested me as much as the horses. This was done with three colours cad. red, cad. yellow and ultramarine and mixing a lot of them on the paper. A couple of watercolours I did recently which I had high hopes for, but they fell a bit flat by the time I had finished. Both were contra-jour. 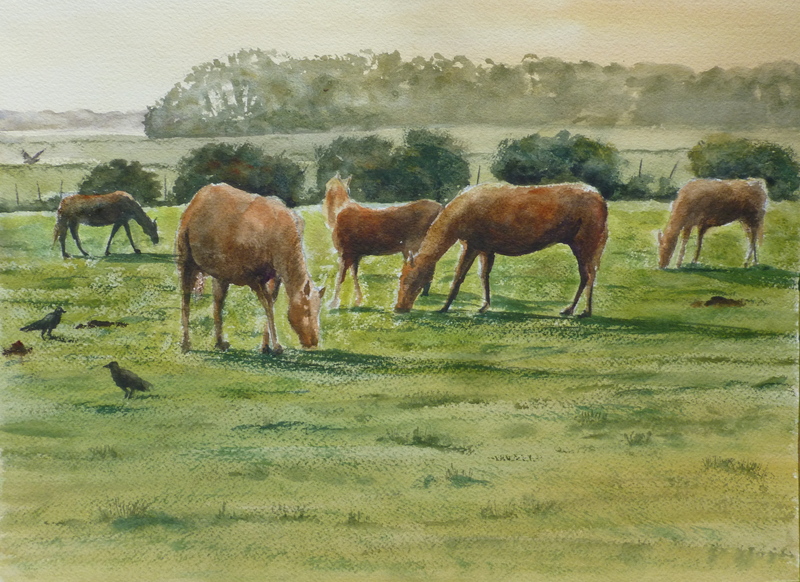 The horses in the evening sun seemed to come out rather flat. The actual horses in the photo were in coats so I took some images of horses from other photos and arranged them in the field but perhaps I had the tones a bit wrong – being wary of overdarkening the horses. I felt the finished painting lacked a bit of punch. The view from the canal seemed to finish up with a mass of reedbeds and rather little else going on. Anyway – I tried. On with the next painting.